Due to the complexity of business regulations in foreign markets, and the time and cost associated to comply with those regulations, a typical Chilean producer of motor vehicles waits an average of more than forty days from the moment it agrees to export its product until the product is delivered (not including the ocean transport time), while a producer of wood products waits an average of only ten days (not counting transport time). These figures do not include the regulations and procedures needed to export in Chile. The same producer of motor vehicles needs its importer partner to obtain an average of seven documents before the product is exported, while the producer of wood products needs its importer partner to obtain less than five documents, excluding contracts signed by the exporter and importer. Although these differences may be due to the different nature of the products exported, they also reflect differences in the costs required to import a product in destination markets. We demonstrate the importance of reducing the costs associated with importing in international markets, using plant-level data from the manufacturing sector in Chile between 2005 and 2007. Given that international trade has been a central element in promoting Chile’s economic development, understanding the role of trade facilitation on international trade is important in this case. Trade facilitation is generally defined as the simplification of the rules governing international trade, including import and export procedures. We focus on three measures of trade facilitation from the Doing Business Report of the World Bank: (1) the monetary cost (excluding tariffs), in U.S. dollars, required to import a 20-foot container, (2) the number of documents required to import, and (3) the number of days required to import in international markets. More specifically, we are interested to see if decreasing the monetary costs of shipping and the paperwork and time required to import makes domestic Chilean firms more likely to export. We use these variables to construct sector-specific measures of trade facilitation for 57 manufacturing sectors in Chile. They are calculated as weighted averages of the country-level trade facilitation variables for the 15 main destination countries of Chilean exports using as weights the importance of each country in the exports of each sector. The 15 main destination countries in each sector account for the majority of Chilean exports at the sector level. What makes a plant an exporter? While we are interested in the effect of foreign trade facilitation, or the lowering of import costs in foreign countries, on the probability of exporting for individual plants, there are other variables that may impact how likely a plant is to export. We consider the main characteristics of exporting and non-exporting plants, including whether the plant imports intermediate inputs, the nationality of the plant, and plant size. The characteristics of plants that export and do not export are summarized in Figure 1. Figure 1 demonstrates that exporting plants import intermediate inputs far more than plants that do not export. Moreover, compared to non-exporters, exporters are more likely to have foreign ownership. Finally, we see that plant size and export status are highly correlated. While exporters are equally distributed among small, medium, and large plants, the majority of non-exporters are classified as small, while only a small fraction of non-exporters are large or medium-sized plants. These patterns suggest that it is important to control for foreign ownership, plant size, and import status in our analysis for export activity as these variables are positively correlated with export status. The positive correlation between export status and variables such as productivity and size has been widely documented in the literature (see, for example, Bernard and Jensen, 1999; Isgut, 2001; Alvarez and López, 2005; Serti and Tomasi, 2008; and Andersson et al., 2008). 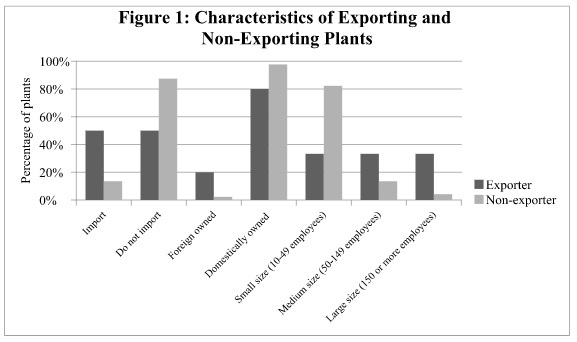 Some of the differences between exporting and non-exporting plants documented in Figure 1 may be explained by differences in the type of product produced by exporters and non-exporters, and also by their geographic location, suggesting that it is important to include sector and region fixed effects in our study. We expect that improving trade facilitation will reduce the costs of importing in international markets and increase export activity of Chilean firms. We measure export activity in two ways: (1) the probability that the domestic firm exports, and (2) the export intensity of the firm (export sales divided by total sales). With regards to export probability, we find that reducing the number of documents and the number of days required to import abroad significantly increases the probability that firms export. A 10% decrease in the number of documents required to import (from a mean value of 6.5 to 5.8) increases the probability of exporting among Chilean plants by 1.10 percentage points. For the case of the time required to import, a 10% decrease of this variable (from 20.1 days to 18.1 days) increases the probability of exporting by 1.06 percentage points. To put these numbers in perspective, according to our estimates, a 10% increase in plant employment would increase export probability by only 0.3 percentage points. For the other plant-level variables the effect is even smaller. With respect to the outcome of export intensity, we find that reducing the paperwork associated with importing in foreign countries significantly increases the export intensity of Chilean firms. While we focus on the impact of non-tariff trade barriers on exporting, it is important to see how foreign tariffs interact with the other costs of importing abroad. We find that improving trade facilitation by reducing the costs of importing has a larger positive impact on export activity in sectors with relatively low tariffs. This suggests that improvements in trade facilitation may not have a significant effect on trade across the border if tariffs are high, and that improvements in trade facilitation can potentially make trade liberalization, in the form of lower tariffs, more effective. This study has important implications for policy. If foreign trade facilitation helps increase export activity of domestic firms, then governments may want to include issues related to how to improve trade facilitation in addition to tariff reductions when negotiating trade agreements. Moreover, the result that trade liberalization has a larger impact on sectors with lower tariffs suggests that trade liberalization may not be completely effective if not accompanied with policies that reduce the costs of trade related to business regulations and procedures. Alvarez, R. and López, R. A. (2005). "Exporting and Performance: Evidence from Chilean Plants," Canadian Journal of Economics 38(4): 1384-1400. Andersson, M., Lööf, H. and Johansson, S. (2008). "Productivity and International Trade: Firm Level Evidence from a Small Open Economy," Review of World Economics 144(4): 774-801. Bernard, A. B., and Jensen, J. B. (1999). "Exceptional Exporter Performance: Cause, Effect, or Both?" Journal of International Economics 47(1): 1-25. Isgut, A. (2001). "What's Different about Exporters? Evidence from Colombian Manufacturing," Journal of Development Studies 37(5): 57-82. Serti, F. and Tomasi, C. (2008). "Self-Selection and Post-Entry Effects of Exports: Evidence from Italian Manufacturing Plants," Review of World Economics 144(4): 660-694.